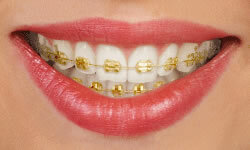 Our gold braces are stainless steel brackets coated with 24-karat gold. Gold has been the most desired metal throughout history and it’s no different today. Our gold braces are popular with patients of all ages. Our gold braces are a luxurious way to help you enjoy a straighter, stronger bite ! Contact us today to enjoy our durable gold braces!